Intel launched its second generation, 64-bit Intel Atom C2000 product family aimed at lightweight workloads in hyperscale data centers. The new Intel Atom C2000, which are the first products based on the company's Silvermont micro-architecture and 22nm Tri-Gate SoC process technology, deliver significant increases in performance and energy efficiency over the previous Atom generation introduced only nine months ago. They also maintain compatibility with the existing software ecosystems. The Atom C2000 features up to eight cores, a range of 6 to 20 Watts TDP, integrated Ethernet and support for up to 64 GB of memory. Intel is delivering 13 specific models with customized features and accelerators that are optimized for particular lightweight workloads such as entry dedicated hosting, distributed memory caching, static web serving and content delivery. The company said this level of silicon customization enables it to expand into new markets like cold storage and entry-level networking. 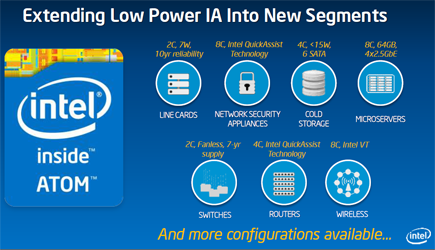 The new Intel Atom configurations also offer hardware accelerators, called Intel QuickAssist Technology, that improve cryptographic performance in applications such as routers and security appliances. Intel said that by consolidating three communications workloads – application, control and packet processing – on a common platform, a great deal of flexibility can be achieved. The Intel Atom C2000 product family, which is now shipping, has more than 50 design wins to date. At a press event in San Francisco, Intel also introduced a new MXC silicon photonics connector that uses Corning ClearCurve optical fiber to provide rack interconnections at 1.6 Tbps at up to 300 meters. 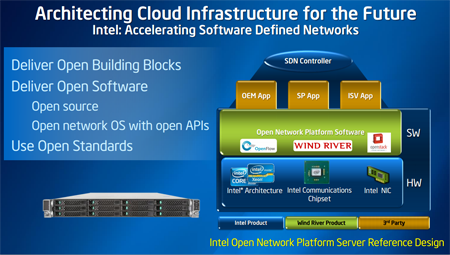 Intel also introduced the Intel Ethernet Switch FM5224 silicon which, when can be combined with the WindRiver Open Network Software suite, enables Software Defined Networking (SDN) capabilities. Specifically, the Intel Ethernet Switch FM5224 silicon and the WindRiver software can be combined to create a 2.5 GbE, high-density, low latency, SDN Ethernet switch for microservers. Switches using the new Intel Ethernet Switch FM5224 silicon can connect up to 64 microservers, providing up to 30 percent higher node density. "As the world becomes more and more mobile, the pressure to support billions of devices and users is changing the very composition of datacenters," said Diane Bryant, senior vice president and general manager of the Datacenter and Connected Systems Group at Intel. 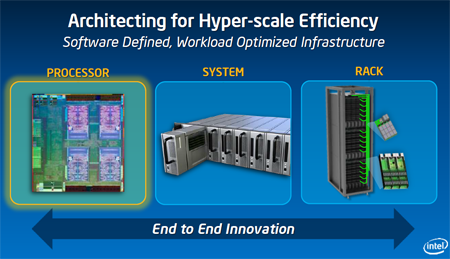 "From leadership in silicon and SoC design to rack architecture and software enabling, Intel is providing the key innovations that original equipment manufacturers, telecommunications equipment makers and cloud service providers require to build the datacenters of the future." At the press event, Ericsson confirmed that it plans to use the Atom C2000 in cloud infrastructure solutions. Microsoft and Intel alco announced a collaboration to innovate on Microsoft's next-generation RSA rack design. The goal is to bring even better utilization, economics and flexibility to Microsoft's data centers. In July, Intel also outlined its roadmap for products based on its forthcoming 14nm process technology, which is scheduled for 2014 and beyond. These products, which are aimed at microservers, storage and network devices, will include the next generation of Intel Xeon processors E3 family (codenamed "Broadwell"). 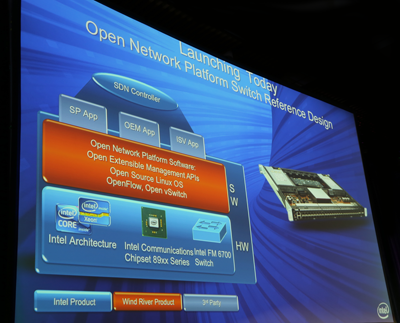 It also includes the next generation of Intel Atom processor SoCs (codenamed "Denverton"). EMC Corporation unveiled significant technology advances in its VNX line of midrange storage, new capabilities for its VSPEX reference architecture, the upcoming general availability of ViPR – a new Software-Defined Storage platform, a preview of "Project Nile" – which EMC expects to be the world's first commercially-available, Web-scale storage infrastructure for the data center. "Customers are demanding more performance and efficiency from their current data center infrastructure while, at the same time, deploying new architectures for their next generation mobile and Web applications. 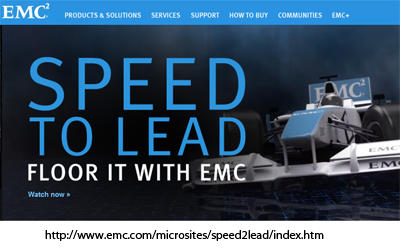 By fully embracing and exploiting disruptive technologies such as Intel MultiCore, virtualization and flash, EMC is providing customers with the products and solutions they need to help transform their IT department," stated EMC President and Chief Operating Officer, David Goulden. The new range of VNX unified, mid-range storage systems leverages the power of flash, accelerating application and file performance by up to 4X. The new platform also delivers unprecedented price/performance—one-third the price for the same performance of the previous generation. All EMC VSPEX reference architectures are now powered by the new VNX Series—delivering 2X more virtual machines at the same prices. The ViPR Software-Defined Storage Platform is planned to be generally available later this month. ViPR is scheduled to include both the ViPR Controller and ViPR Object Data Services. ViPR Object Data Services gives customers the ability to view objects as files, providing file access performance without the latency inherent in current object storage models. Project Nile aims to give IT departments or Service Providers the ability to deliver easily consumable storage services, similar to those offered by the Web scale Public Cloud providers, but with the control security and reliability of a Private Cloud. Project Nile is intended to support multiple standard APIs including Amazon Simple Storage Service (S3), OpenStack Swift, HDFS and EMC Atmos. 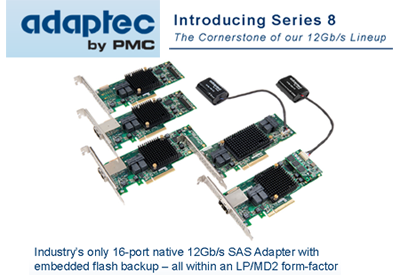 PMC is pushing the performance of SSD flash storage ahead with the introduction of its Adaptec Series 8 12Gb/s SAS RAID Adapter family for high-performance server and networked storage. The 12Gb/s SAS interface is backward compatible with existing 6Gb/s SAS infrastructures. The Adaptec 8 series leverages PMC's I/O protocol controllers, RAID-on-Chip (RoC) controllers, SAS expanders, Solid State Drive (SSD) controllers and advanced software to offer a complete 12Gb/s SAS implementation. This is the first time that a complete 12Gb/s SAS architecture has been available to access the untapped performance of 12Gb/s SSDs. Adaptec Series 8 delivers >700,000 4k random read RAID I/Os per second, a 60 percent improvement over the previous generation. The technology also provides the flexibility to create hybrid storage arrays of SSDs and HDDs. Adaptec’s fourth generation caching solution also features tiering technology that can configure all storage devices in a server environment, not just those connected to PMC hardware. All storage assets in a server can be leveraged according to their performance capabilities with the fastest media used for data acceleration, enabling the most cost-effective storage architecture. PMC said its 12Gb/s SAS architecture is optimized to deliver the performance, flexibility and density needed for dynamic data in cloud computing, content delivery networks, and mission-critical database applications. The Series 8 family supports the PCI Express 3.0 specification. "With our new Series 8 RAID adapters, PMC is now addressing all the key points of 12Gb/s SAS connectivity," said Jared Peters, vice president of Server Storage Solutions at PMC. “We designed our Series 8 adapter family to enable denser, faster and more configurable storage environments, which translates directly into faster data delivery and access. With innovations like the maxCache Plus™ tiering capability for Series 8, we continue to provide the technology that helps datacenter architects get the most value and performance out of their storage assets." "Our new 12Gb/s SAS SSDs dramatically improve response times to dynamic and mission critical data in cloud and datacenter environments, but an end-to-end 12Gb/s SAS architecture is a critical part of the foundation of the build out," said Gary Gentry, senior vice president and general manager of Seagate’s solid state drive business. "Products like PMC’s Series 8 adapters are key elements that will allow data center architects to realize the full benefits of our industry-leading SSD performance." Sony launched the world's first 4K Ultra HD video download service, providing access to an expanding library of native 4K Ultra HD feature films and TV shows. The service, which launches with about 70 full length native 4K Ultra HD feature films and TV shows from Sony Pictures Entertainment and other producers, offers customers the option to rent and purchase content for download on Sony's 4K Ultra HD Media Player (FMP-X1) for playback on Sony 4K Ultra HD televisions. 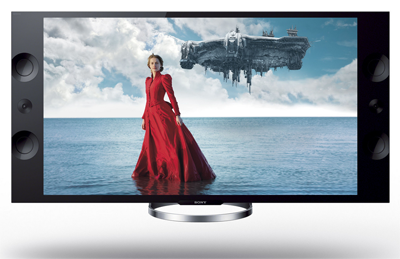 Sony also expanded its 4K Ultra HD TV line-up with the addition of 55- and 65-inch models. 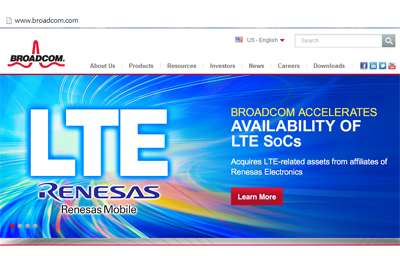 Broadcom agreed to acquire LTE-related assets from affiliates of Renesas Electronics Corporation for approximately $164 million in cash. Broadcom is gaining a dual-core LTE SoC that is ready for volume production and is carrier-validated by leading global operators in North America, Japan and Europe. Broadcom also receives high-quality multimode, multiband, LTE-A/HSPA+/EDGE modem IP that includes support for leading-edge features such as Carrier Aggregation and VoLTE. The acquisition adds quality patents and applications to Broadcom's IP portfolio and brings some of the world's most experienced cellular engineers to Broadcom. Broadcom said the deal will accelerate the launch of its first multimode, carrier-validated LTE SoC platform, which is now expected in early 2014. "Today's transaction firmly establishes Broadcom's presence in the rapidly growing LTE market with a production-ready, carrier-validated SoC," said Scott McGregor, President and CEO of Broadcom. "Our LTE platform will leverage Broadcom's rich connectivity portfolio and will deliver an optimized feature set for this fast growing market." Broadcom also updated its business outlook for the three months ending September 30, 2013. The company now expects revenue between $2.075 billion and $2.175 billion; GAAP and non-GAAP product gross margins to be up roughly 50 to 100 basis points; and GAAP and non-GAAP research and development, and selling, general and administrative expenses to be somewhat above the high-end of the previously guided range of down ~$5 million to up ~$15 million and flat to up ~$20 million, respectively. Qualcomm is launching "2net Mobile", a gateway for aggregating clinical data from multiple medical device sensors into one unified stream on a variety of mobile phones and tablets. 2net Mobile is a white-label solution for secure data transmission in compliance with HIPAA security requirements. Specifically, 2net Mobile is a software module designed to enable Android smartphones, tablets and other data-capable devices to take on the gateway functionality of the 2net Hub. The 2net Hub, which launched in December 2011, delivers short-range radio flexibility, security, interoperability and seamless data transfer, while serving as the information highway for machine-to-machine connectivity for wireless medical devices into and out of the home. 2net Mobile will allow this connectivity to extend beyond the home so that users can securely monitor and transmit their readings while on-the-go. Qualcomm is now offering a 2net Mobile Software Development Kit for those interested in using the 2net managed services through their applications. "Our objective with the launch of 2net Mobile is to further support our customers' business strategies in remote patient monitoring, while enhancing the ability to innovate on the 2net Platform," said Rick Valencia, vice president and general manager, Qualcomm Life. "Through its open approach to connectivity, transmission and aggregation of data on mobile phones and tablets, 2net Mobile improves the capability of users to monitor their health anytime, anywhere." 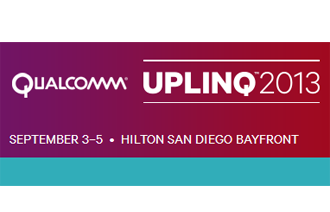 Qualcomm Life will be showcasing 2net Mobile the company's Uplinq 2013 event this week in San Diego. The data center Ethernet switch market posted record revenue and shipment results in 2Q13, according to the most recent Data Center Switch Report from Crehan Research. 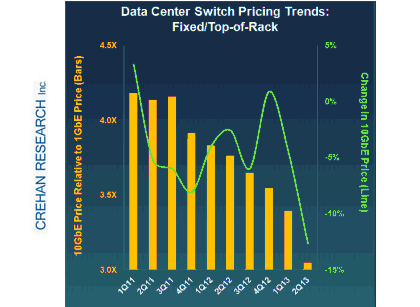 The data center market's overall growth was propelled by 10 Gigabit Ethernet (10GbE) price declines. As shown in the accompanying figure, 10GbE pricing within the fixed/top-of-rack switch segment – which accounts for a majority of overall data center switch shipments – is now almost at three times that of 1GbE. "Offering ten times the bandwidth for only three times the price of 1GbE is a key threshold for 10GbE data center Ethernet switch adoption,” said Seamus Crehan, president of Crehan Research. "This type of pricing should finally drive mainstream 10GbE data center switch adoption." Last month, Crehan reported that 10GbE adoption within servers also returned to strong growth in the second quarter of 2013, with shipments and revenues posting double-digit increases. In line with a strong quarter for data center networking investment, Fibre Channel Switching also enjoyed a sequential increase, albeit much more modest than that of the data center Ethernet switch market. Cisco had a particularly strong quarter, with its recently introduced flagship MDS 9700 Director switch driving close to a 40% increase in its overall Fibre Channel switch revenues. Ciena reported revenue of $538.4 million for it third fiscal quarter of 2013. Net loss (GAAP) was $(1.2) million, or $(0.01) per common share, which compares to a GAAP net loss of $(29.8) million, or $(0.30) per common share, for the fiscal third quarter 2012. 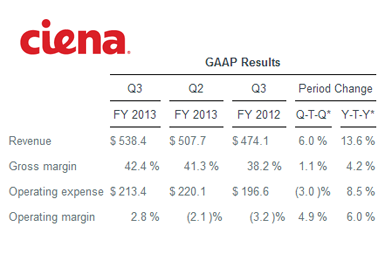 Ciena's adjusted (non-GAAP) net income for the fiscal third quarter 2013 was $26.2 million, or $0.23 per common share, which compares to an adjusted (non-GAAP) net loss of $(4.1) million, or $(0.04) per common share, for the fiscal third quarter 2012. "Differentiated by our specialist strategy, we have increased our market share, achieved steady growth, and delivered improved and more consistent financial performance over the last several quarters," said Gary Smith, president and CEO. "We believe that by expanding our role in the industry and extending our reach within our markets, we will be positioned to deliver greater profitability that is more sustainable over time." The Enterprise Edge market reached almost $3.5 billion in the second quarter of 2013 -- an increase of two percent versus the year-ago period, according to a new report by Dell"Oro Group. Enterprise-class 802.11ac wireless LAN products shipped for revenue during 2Q13. "With new 802.11ac-compliant WLAN devices now shipping, enterprises are faced with the prospect of having to upgrade their cabling and campus Ethernet switches to satisfy the greater power and throughput requirements for these devices," said Chris DePuy, Vice President of Enterprise Edge research at Dell'Oro Group. "Much of the installed base of Ethernet switches that are 802.3af-capable may not be adequate to service 802.11ac wireless. Newer switches have more power available, yet the throughput needs of 802.11ac may require multiple Gigabit Ethernet ports or even 10 Gigabit per second ports which may drive additional in-building cabling." 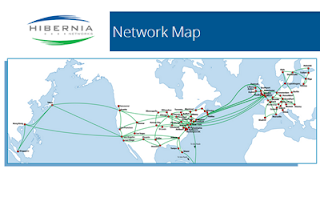 Hibernia Networks has acquired Atrato IP Networks, a provider of IP-transit and carrier services based in The Netherlands. Financial terms were not disclosed. Atrato’s services include IP-transit, remote IX and managed services. The company has a presence across Europe and U.S.